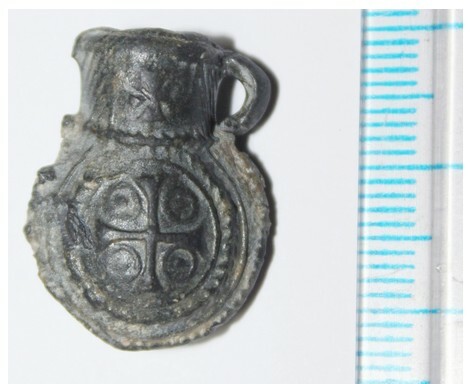 The most important recent find from the ancient and medieval port of Burgos (Poros) on Cape Foros,, a lead tube reliquary containing ashes from the grave of John the Apostle in Ephesus, will be exhibited by the Burgas Museum of Archaeology, Burgas Municipality has announced. The unique discovery, which was made during the excavations of the Fortress of Burgos (Poros) in 2014 but was only made public at the end of March 2015, will be displayed at the Burgas Museum of Archaeology (Burgas Regional Museum of History) as of May 18, 2015, Museum Director Milen Nikolov has confirmed. The lead reliquary containing powder from the grave of John the Apostle (known in Bulgarian (Eastern) Orthodox tradition as St. John the Theologian) is still being restored. The lead tube reliquary containing the ashes from the grave of John the Apostle (St. John the Theologian) is only 2.2 cm (less than an inch) long, and its diameter measures 1.7 cm. However, in spite of its small size it is richly decorated with the image of an equal arms Byzantine cross within two medallions on one side, and the images of two overlapping crosses with drop-shaped ends of their arms, also within two medallions on the other side. Two more crosses can be seen on the neck of the reliquary tube. 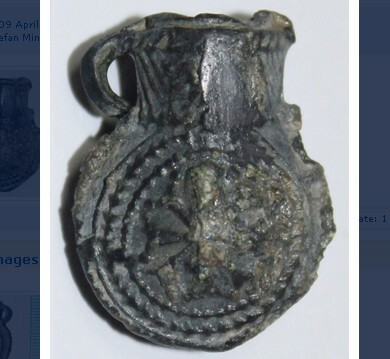 Burgas Municipality points out that there is also a group of clay tube reliquaries from the ancient city of Ephesus in Anatolia which were bought at the end of the 19th century for the Louvre Museum in Paris. These clay tubes are connected with the cult for St. John the Theologian (John the Apostle), Jesus Christ’s favorite disciple. Burgas Municipality notes that until now it has been believed that only clay reliquaries were produced in Ephesus but the Burgos (Poros) find proves that this was not the case. The ancient and medieval fortress and port of Burgos (Poros) is located on the Cape of Foros in the Bulgarian Black Sea city of Burgas. It was first first excavated in 2008 by archaeologists Milen Nikolov (currently Director of the Burgas Regional Museum of History), Dr. Tsonya Drazheva, and Konstantin Gospodinov, after access to its site was denied for decades because of the existence of a nearby military base which has been closed down in recent years. Part of its fortress wall was first discovered in 1989 during the construction of a cow farm. Even though there have been traces of ancient life, the fortress and port city of Burgos (Poros) on the Cape of Foros in Bulgaria’s Burgas is dated back to the Late Antiquity / Late Roman period, with the Bulgarian archaeologists uncovering a large number of buildings, artifacts, and pottery vessels dating back to the 4th-6th century AD. Their excavations have revealed a complex set of fortifications, including walls, ramparts, and towers, which were rebuilt and reorganized multiple times from the 4th until the middle of the 15th century, and were in use throughout this entire period by different states: the Roman Empire, the Byzantine Empire, the Bulgarian Empire, the Ottoman Empire. Some of the more interesting finds including a stone block with an Ancient Roman inscription in Greek mentioning the name of Roman Emperor Gordian III (r. 238-244 AD); a 2nd century AD inscription carved into stone stating that “burgi” (fortifications) were built on the border of the Roman colony of Deultum (located some 10 km inland from the Black Sea coast near today’s town of Debelt) – hence, possibly, the name Burgos; a basilica; the remains of a small monastery called “St. George” which is described in a 13th century Byzantine source; the 6th century lead tube reliquary containing ashes from the grave of John the Apostle in Ephesus, Anatolia.